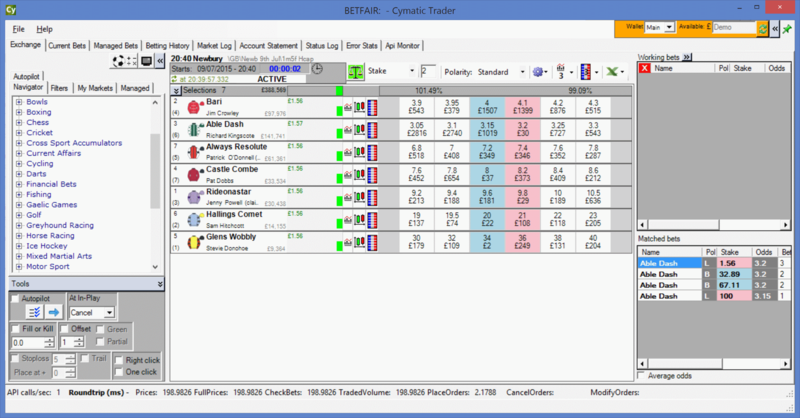 The grid is a familiar interface, somewhat similar to the Betfair website, but with a number of enhancements. The picture above shows a grid interface contained within the main Cymatic application window. You can also open multiple grids in separate windows without all the surrounding tools and tabs of the main application window. The market shown here is a horse race chosen from the Navigator panel in the left column of the main window. The Navigator appears only in the main Cymatic window, it lists all the event types (soccer, tennis etc) and each event can be expanded to show the markets within it. In the right column of the grid you can see unmatched and matched bets. Simply click on a bet to edit it, or click the X to cancel it. New bets can easily and quickly be created by clicking on a price. You can highlight the prices at which you have unmatched bets, which makes it really easy to see your position in the market. To choose this setting, go to the File Menu | Setttings | Layouts and choose 'Highlight the location of my unmatched bets on the grid'. Each row in the grid includes buttons to quickly open charts and ladders, or to green up. There are various options and buttons across the top of the grid, enabling you to sort the order of the rows, change various settings affecting just that grid, open multiple charts or ladders with a single click, link to Excel, or green-up the entire market in one go. Across the bottom of the main application window you can see the api/internet roundtrip durations. There is also a comprehensive statistical summary and analysis of every API call in the API Monitor tab.